Shot in 1938 Too Much Johnson was Welles first feature, the film that helped him hone his craft and led him to create to the masterpiece that is Citizen Kane. 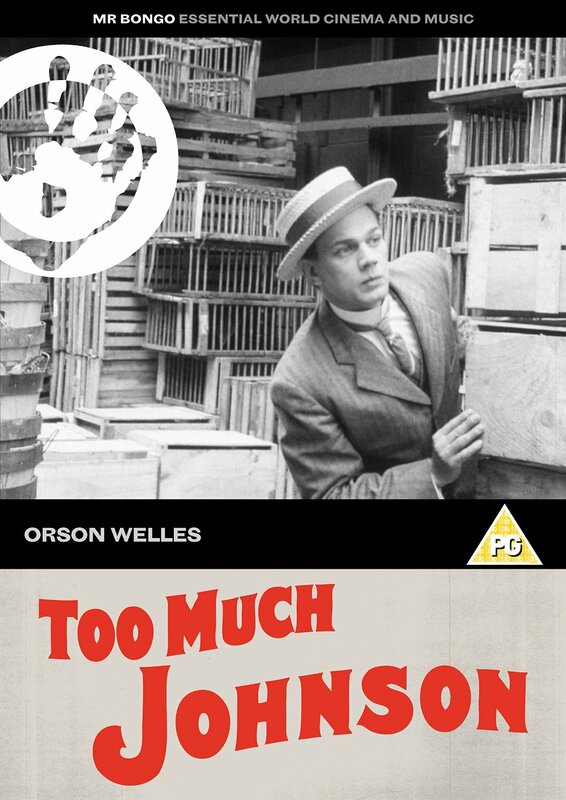 Shot in 1938 Too Much Johnson was Welles first feature, the film that helped him hone his craft and led him to create to the masterpiece that is Citizen Kane. Shot in 1938 Too Much Johnson was Welles first feature, the film that helped him hone his craft and led him to create to the masterpiece that is Citizen Kane. The footage was presumed destroyed in a fire in Welles home in 1971 but was recently rediscovered in Italy and the restored 66 mins version makes its UK DVD debut. Too Much Johnson is an elaborate 1890s farce of mistaken identity. Cuckolded husband Dathis (Edgar Barrier) is on the tale of a man named Billings (Joseph Cotten), who has been having an affair with Dathiss wife (Arlene Francis). Billings flees by ship to Cuba, where now also hiding from his own wife (Ruth Ford) and mother-in-law (Mary), he adopts the identity of a plantation owner named Johnson, who is expecting a mail-order bride. Orson Welles plays a Keystone Kop. Shot in 1938 Too Much Johnson was Welles first feature, the film that helped him hone his craft and led him to create to the masterpiece that is Citizen Kane. The footage was presumed destroyed in a fire in Welles home in 1971 but was recently rediscovered in Italy and the restored 66 mins version makes its UK DVD debut. Too Much Johnson is an elaborate 1890s farce of mistaken identity. Cuckolded husband Dathis (Edgar Barrier) is on the tale of a man named Billings (Joseph Cotten), who has been having an affair with Dathiss wife (Arlene Francis). Billings flees by ship to Cuba, where now also hiding from his own wife (Ruth Ford) and mother-in-law (Mary), he adopts the identity of a plantation owner named Johnson, who is expecting a mail-order bride. Orson Welles plays a Keystone Kop.